The Odyssey Black iX 1 putter, what does it really feel like? Where can you buy one cheaply? Live links to the best new and used prices online. Continue reading "The Odyssey Black iX 1 Putter. Best-Putter.com's independent review "
This picture of the Odyssey Backstryke blade might leave you feeling a little bit queasy!, especially if you haven't seen many onset putters before. Continue reading "Odyssey Backstryke blade. Independent review from www.Best-Putter.com"
Is the Odyssey Backstryke really as good as it's claimed to be? We were impressed by it... Independent hands-on review from www.Best-Putter.com. Continue reading "The Odyssey Backstryke. Independent putter review from Best-Putter.com"
Continue reading "Odyssey 2 Ball Putter. Best-Putter.com's independent, honest review"
Continue reading "The Odyssey 2 Ball Blade. Best-Putter.com's independent, honest review"
The best hands-on review of the Odyssey White Ice 5 putter, what does it really feel like? Where can you buy one cheaply? Live links to the best new and used prices online. Continue reading "The Odyssey White Ice 5 Putter. Hands-on review from Best-Putter.com"
Continue reading "Does cutting my 35 Ping Answer 70's vintage affect the weight"
Continue reading "Mint 8802 Wilson putter"
This is the best putting tip bar none, and it's easy to use. Get started today! 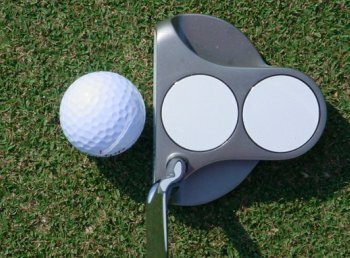 Continue reading "The Best Putting Tip Bar NONE!" 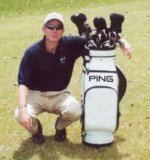 Continue reading "Find the Putter You Want At The Best Price with Best-Putter.com"
Continue reading "The top 10 putting tips of all time - if you want to seriously improve your putting, sign up and receive these free tips"
Is a fat grip appropirate for a toe balanced putter? Continue reading "Is a fat grip appropirate for a toe balanced putter?"